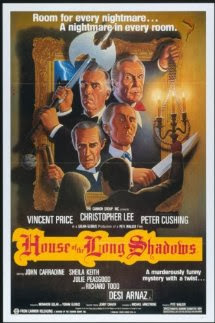 "House of the Long Shadows" (1983) starring Vincent Price, Christopher Lee, Peter Cushing, John Carradine and Desi Arnaz Jr. is a comedy / horror movie about a man who on a bet goes to a haunted house to write a book. Kenneth Magee (Arnaz), an American writer places a $20,000 bet that he can write a novel in one night. In order to concentrate and get in the mood, he goes to an old mansion without electricity to write the novel. 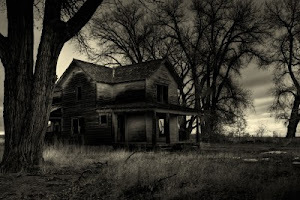 It is supposed to be deserted but soon after his arrival in the dusty old house, other people start arriving. Who are the assorted characters that keep coming out of the stormy night? And who else has been hidden away in the house for the last 40 years? 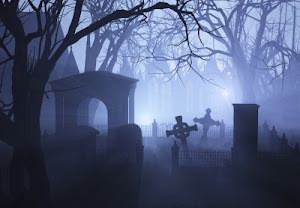 A somewhat fun comedy / horror story that brings out all the classic horror tropes: candlelit walks through a dark, scary house, thunder and lightning, secret passageways and creepy characters. 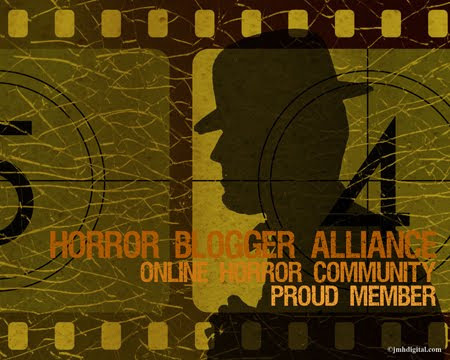 Classic horror stars Price, Lee and Cushing join in the fun and even though not a spectacular movie, it may just be worth it to you to see these horror greats all together in one film. Honestly, I also want to visit any place who is haunted lol. I just want to experience this thing too in my life. And this is a great share!